Give your children a true nature camp experience this summer! We are offering TWO different camps for children 3-13 years old. 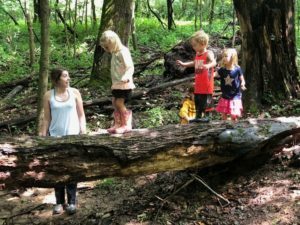 Thrive Forest Camp at Creasey Mahan Nature Preserve is a nature immersion program for children 3-6 years of age. Held Monday-Friday from 9:30am – 12:30pm, Thrive Forest Camp will have children climbing on logs, splashing in streams, catching frogs, creating woodland music and artwork, and enjoying all the forest has to offer! This child-led, exploratory play program is perfect for young children to build confidence and social connections. Your child will come home dirty or your money back! Sessions run in June and July. CLICK HERE to apply, or email Thrive@KYNaturePreserve.org with questions. 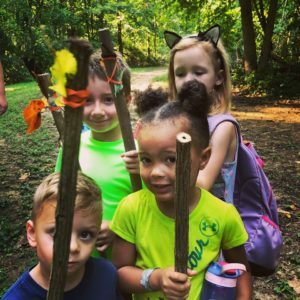 Nature Camp at Creasey Mahan Nature Preserve is for campers entering 1st grade to 6th grade and offers a classic camp experience: archery, bb-gun practice, hayrides, special guest speakers, hiking, nature crafts, tie dye, games, and more. Every day is an adventure! Camp runs from 9am – 2pm, Tuesday-Friday, for two weeks in June. Forms available at www.KYNaturePreserve.org or email Charon@KYNaturePreserve.org with questions. Engaging children with nature is the gift that keeps on giving. See you at camp!